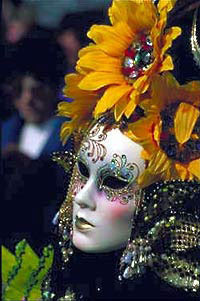 First off, Happy Mardi Gras! There was milk punch, hurricanes, crawfish, red beans, rice and king cake had a plenty around here last night. Eat, drink and be merry for tomorrow we fast! 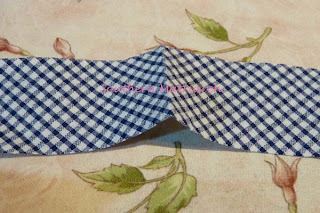 I received an email from Diana the other day asking about the steps involved in attaching a collar with a bias band. I will try to answer that here. 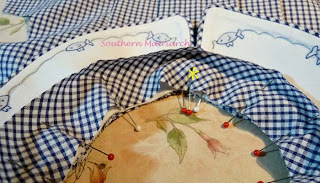 Here is the front and backs of my "GoIng Fishin" romper ready for my collar. Layer one. 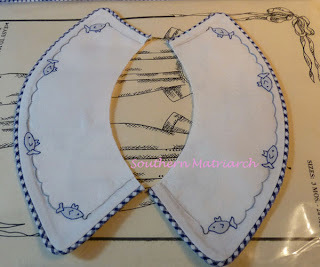 My completed collar. This will become Layer 2. 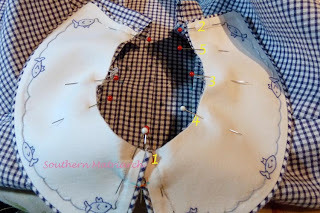 To insure that my collar remains together at the center front I like to take a stitch on the seam line of my two collar pieces. This is done in orange thread so you can see. 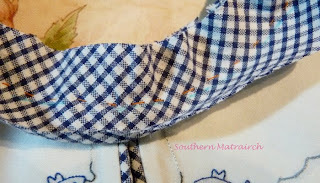 In stitching my two collars, I obviously took a tiny bit bigger bite in the outer seam on one than the other. This resulted in one being a tad shorter than the other. So before I marked my seamline, I lined up the bottom edges, as opposed to the top raw edges. What would it matter if the raw edges met and the bottom of the collar wasn't even? So collar center stitched together. Next I pin my collar to the romper. First pinning at center front, then center back etc as numbered on the right. Now sure why those two random pins are stuck in that way on the left. It wasn't that way when I basted it. Mystery. For the third and top layer, my bias strip. I press a center mark into my bias strip. 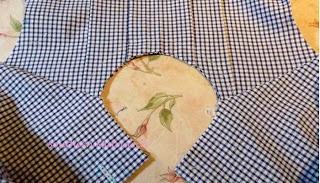 I pin the bias strip on top of my collar starting at center front and working towards center back in the same manner I pinned the collar on. So do you see how you have three layers? The romper on the bottom, the collar next, topped by the bias strip. 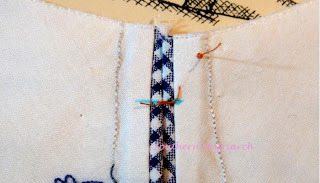 For me it is easier to stitch without the pins in the way. So I basted my three layers together right above the seam line. I can assure that my collar is where I want it, the centers are where I want them having much more control when I baste it first. Only takes about 10 minutes and uses less time than taking the whole back apart when I am not happy with it. I did just notice that my two fish hooks don't appear even. Shoot. This happened! 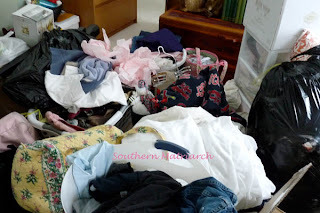 This is what it looks like when offspring return home. Baby daughter has moved back north and this was the first wave of unloading into my front entry way. Wish me luck. seriously? That baby girl has a bit of laundry ahead of her, no? I am in awe of your ironing...everything you post is perfection. Last year, lace joining, this fall, ironing!!! I always thought it was one of my skills, until I saw what you put out. Oh gosh! This was like reading a mystery, and waiting for the climax of the story, and then it ends without an ending. LOL I can't wait for the conclusion, but I understand the interruption. Life happens! ROFLOL - you make me laugh and I love anyone that can do that! Can't wait till the laundry is done so that I can read the conclusion! Hey, laundry happens! Looks like DD has some work cut out for her. It must be wonderful to have her home, other than the laundry part. Just when I thought the plot thickens I have the "to be continued...". That's all right I am putting the lace in my collars after baby Isabel goes to sleep. Thank you so much for posting these instructions! Thank you, Martha, very much for these directions.